The low thunk – thunk – thunk is reassuring. It means the kava I have been invited to share at the nakamal tonight is being pounded rather than prepared in the more stomach-churning traditional method. 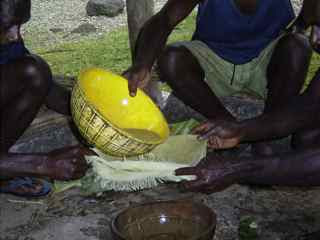 The nakamal in the village of Nikaura, Epi Island, Vanuatu, is a nakamal in the original sense. Unlike the “nakamals” in Port Vila, the country’s capital, which are no more than kava bars, Nikaura’s acts as a public hall, an overflow church, the village court and an education centre. It is also somewhere for the men to meet, when the sun dips behind the volcanic hills that flank the village, and drink kava. fern logs built around a frame that will stand the test of time, space, any dimension you want to throw at it. And I wonder where the crane came from to lift the roof beams into place. The women weave the thatch for the expansive roof but otherwise are not involved in nakamal-building. There are some clear distinctions between men’s and women’s business in Vanuatu, the strictness of which depends on where you are. In Nikaura, women do not generally drink kava. Being a white woman I am not only exempt; I am also a special guest and therefore expected to participate when invited. The thunk – thunk – thunk continues in the dusk, as the mosquitoes begin biting and the changing tide turns up the volume of the waves. The squeals of children playing in the shallows and running barefoot on the coral beach carries up into the cooler darkness of the nakamal. The men talk quietly; in Bislama to me, in local language to each other. They have spread out a pandanus mat for me to sit on and I have respectfully chosen to wear a garishly coloured island dress. I am thankful for the sound of pounding kava because the traditional method is to have young boys chew and spit out the root of the plant used to make the narcotic drink before it is soaked in water and strained through a cloth. It is the muddy-looking solution that is drunk as kava. It tastes similar to how it looks, although the visual image cannot prepare you for the bitterness, or how it might catch in the back of your throat, or how your gag reflex may respond to such a foreign encounter. All of these reactions are heightened if you know it has been in someone else’s mouth already. This is interessting, I'm glad you shared this. Dear Deb. 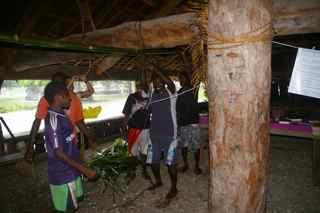 I recently assisted the Vanuatu Cultural Centre compile a report on traditional architecture post-Tropical Cyclone Pam. I would like gain your permission to include an image of the Nikaura' Nakamal from your blog within a UNESCO publication. Could you please email me at wendymchristie@gmail.com for further detail? Best regards, Wendy.